Maldives is well known for its crystalline blue waters surging gently against isolated stretches of pristine white sand, the islands of the Maldives offer a peaceful sanctuary from the harsh realities of the outside world. These beautiful islands are amazingly remote and almost impossibly pure: the breeze rusting through the palm leaves is often the only reminder that you are not trapped in a photograph or postcard. With good weather throughout most of the year, Maldives makes a great choice for an idyllic beach getaway. It is the ultimate dream of luxury and tranquility. Here, I share with you why Maldives should be on your travel bucket list. It was 26/10/16- 6:15PM I departed from Singapore to Maldives. It’s actually quite a long journey from Singapore to Malè airport as it takes roughly 4 hours and a half by plane. It was kinda not a good flight though, experienced turbulence for like half of the journey. But this doesn’t stop my excitement to see the beauty of Maldives. This is it! Finally it’s time to experience the Maldivian life. When landed you have to walk a bit to the immigration before entering to the country (don’t forget to fill up immigration card), after cleared and you are out in immigration you will see a lot of resort booths. You will go to the Zone where your resort booth is. There you can approach the staff how they will send you to your resort. When you book your resorts most of it are inclusive of speedboat/seaplane while others maybe charge separately. On my first day I stayed overnight near the airport coz I arrived late night and most of the transportation is unavailable to send you in your exclusive island or resorts but I think you can book a private one but would probably cost you a lot. Fortunately, you could always go to their information centre and you can use their phone for free to call your resort. I also called the resort because I was not so sure about the timing of the shuttle. After confirming with them roughly 10minutes they picked me up (transfer is free). Hotel Lonuveli is literally in front of the sea. An astonishing view of the ocean sun rise, beach and the clear lagoon are to be enjoyed with its serenity. 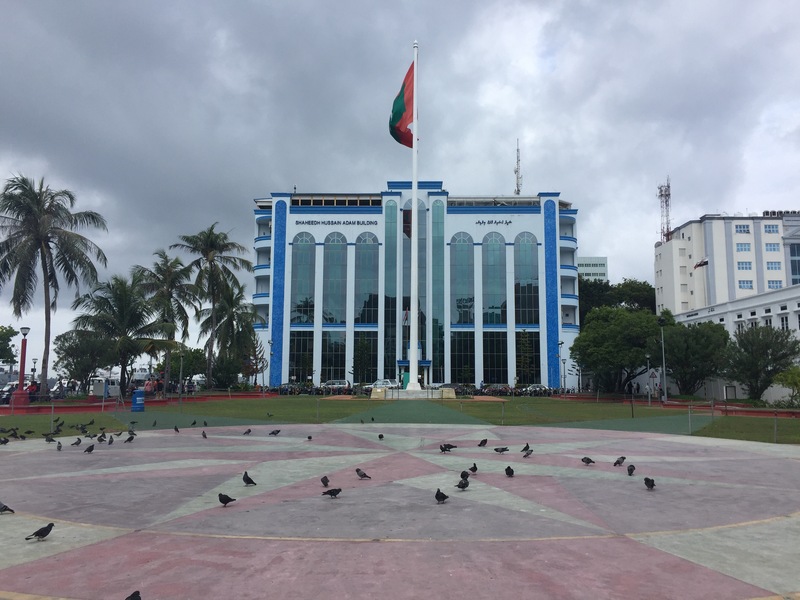 The hotel is just 15 minutes drive from Ibrahim Nasir International Airport, 20 minutes by ferry from Capital Island Male’ and a few steps away from the sandy beach & the crystal clear lagoon. But what I like the most is the nice view of my room a lovely crystal clear beach. The next day I woke up so early to catch the sunrise but when I checked the clock its just 3AM I kinda need some little adjustment of the timing since Maldives is 3 hours ahead than Singapore its body clock problem I guess. I went to the seashore and had a short walk it is just in front of my hotel so its like a minute walk to reach. I was so mesmerised with the view, they had a natural pool in the middle of the sea where a lot of locals and tourists having some bathe and taking photos as well. While waiting for my early breakfast I start preparing for a transfer in another resort. Around 11:30AM they sent me to Malè Airport, yes they have to sent me there since most of the transportation going to the resort is in there. Same as on first day I went to the booth of the resort where I am going to stay and informed the staff that I made a booking on the resort (show confirmed booking), if its confirmed they will inform you of the time when to leave and let you wait awhile and because the speedboat will be leaving at around 12:15PM and it’s like 20 minutes more to go, I decided to have my lunch first at the airport. Well, not so many choices (Burger King, Thai Express, A Cafe and Swensen). Had my lunch return back to the booth and in like 5mins we leave and went to the ferry terminal. We took speedboat and reach the resort in about 20mins. Finally, we reached at the resort. Adaaran Prestige Vadoo the prestigious Maldives Luxury Resorts, where time ceases to exist and the voice of the Indian Ocean beckons you to her shores. As the gateway to the South Atolls, Vadoo possesses its own exotic reef teeming with vibrant aquatic flora and fauna. Service was the best in this resort, warm welcome and refreshing towel and drinks were offered. We waited in the bar till we can check in but my booking was not included speedboat transfer fee so then I have to pay in the reception before I can check-in (roughly 165usd/pax two way). When done I feel the excitement because of my water villa room and yes Maldives should be like that though. Teak wooden floorboards with piles of feathery linen on a four poster king size bed, in a serene and tranquil Water Villa await you. The lounge area of the bathroom comes with a glass panel to watch the colourful fauna that swims beneath you. Perched atop the crystal clear waters surrounding the atoll, guests residing at Water Villas will enjoy a private gateway to the vast, beckoning ocean that encompasses them. Manta rays, stingrays, Napoleon wrasse, parrot fish and turtles swim the turquoise waters of the surrounding sea. The spacious outdoor deck of water bungalow allows you to jump straight into the glistening clear waters of the ocean, any time of the day. It was indeed a lovely room, got private outdoor pool with a stunning view of the beach. Got nice Jacuzzi, with complimentary white wine and fruits, so spacious and they cleaned it everyday and they even do maintenance especially the outdoor stairs going to the beach to avoid slippery, the room is always organized. First activity I did was swimming of course, you would love the crystal clear water, even near the shore you would be glad seeing the lovely fish swimming. You can borrow the goggles, scuba diving fin to snorkel. But if you feel bored you can deep into their outdoor pool. The fish are very punctual on feeding time. Resorts have an assigned spot to have this activity and fish starts coming about 15 minutes before the actual time. They come and make turns just like an aeroplane hovering above. Once feeding starts its like happy hour. After about 20 minutes the show comes to an end and it takes only about 5 minutes for all fish to disappear. Its amazing how clever these creatures are and they certainly have wisdom than most us would think. End the day with beautiful sunset, a yummy tenderloin dinner. The restaurant is always open till 10:30pm but they got Japanese Resto and Bar too. On the second day, I transferred to another resort. I left Adaaran like 11am to catch my 12:15pm transfer speedboat at Malè . Reached Malè after 20mins then waited for my next speedboat to Bandos island. It was like 30mins travel time to reach and the place was so calm. Was welcomed with drinks and waited to check in. Malahini Kuda Bandos Resort was the cheapest among the rest with decent new hotel. The island is also very close to the airport which not only reduces commute time, but also saves you a lot of money on the expensive airport transfer. Simplicity and solace is one of the things which attracted me here in the first place. Although colorful corals are dying in oceans across the world (no different in the Maldives), with regards to a wide variety of beautiful tropic fish, the snorkeling just a few meters from the beach was quite lovely. They got gym located right in front of the beach so you can enjoy the white sandy beaches and Tiffany blue seas while working out as well. Got 2 bars and hub for water sports (parasailing, scuba diving, jet ski, snorkeling, banana rides, etc.) You can always play indoor games such as cards, pool and chill on the bar. Malahini Spa features three treatment rooms and a Jacuzzi to allow travelers to unwind and relax. The resort is located close to some fantastic dive sites. Several water sports activities to fill your afternoons. Offer you a wide range of motorized and non-motorized sports. I know you don’t want to spend your nights in the room. On one of the nights there was a special open bar dance party ( Maldivian Vibe) Overall, my 3 days stay at Malahini Kuda Bandos Resort was exceptional and a very relaxing time. A holiday in the Maldives isn’t just about swimming in the crystal clear waters of the Indian Ocean and soaking up the sun on the beautiful white sand beaches. On my the last day I explore the beautiful city of Malè. Walking around and surveying the authentic lives of ordinary working people in Malè. Visit the fish market and local market, President’s Palace, Sultan Park, and the Friday Mosque. This gives the traveller an opportunity to view Maldives in a totally different light. So whether you want to mingle with the locals, or want to laze on your own private island, or want to dive with manta rays and sharks, I highly recommend visiting the Maldives before the islands become too overdeveloped.